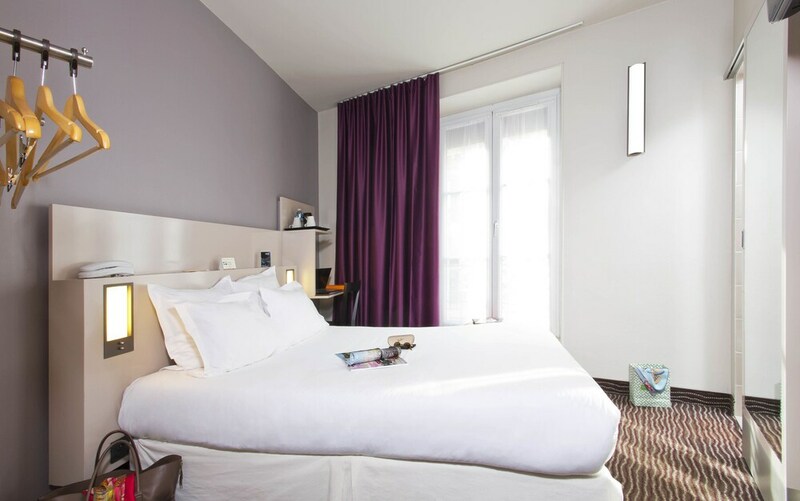 Hotel Libertel Montmartre Opéra is located in a quiet street, outskirts of Paris, and just a few minutes from the famous Parisian cabaret Moulin Rouge in addition to many other attractions. Nearby the hotel you will found the subway stations Blanche and Pigalle, from where you can get any part of the city of Paris. The reception staff will give you a warm welcome on your arrival and accompany you until your room. At reception you can also ask for advices and information about places to visit, to enjoy better your visit to Paris. The hotel has rooms of different categories according needs of its guests. These rooms have modern decor and good lighting. Also are spacious and provide comforts like a large bed, air conditioning, flat screen TV, connectors for iPod and iPhone, free Wi-Fi connection and many other amenities. This room has a private bathroom with hairdryer and personal care products. This room is very spacious and is perfect to accommodate up to three persons in its comfortable beds. As the Club Room the family room provide amenities including free internet connection in addition to a 32-inch TV with entertainment channels. This room offers all the amenities of the club room, but it is much more spacious. It is ideal to accommodate up to 2 people. This room offers excellent value for money, provides all facilities and comforts available on other rooms per a cheaper price. All rooms are non-smoking. After a relaxing break you can ask for tourist information at reception where also will you find city maps and daily newspapers. You can also store valuables objects, ask at reception. The hotel also offers a delicious typical French breakfast in the dining room for an extra fee.